That the war in Afghanistan has widely been considered, albeit somewhat sarcastically, as the “good war”, is something of a work of magic by the Pentagon and its media-influencing personalities. If one views war from a standpoint where the only visible casualties are those who have lost their lives specifically in on-the-ground violence, Afghanistan can be seen as “better” than the war in Iraq. Though every life is sacred and every death hits home the same way, the multiplication of that by hundreds of thousands is surely a significant thing, especially in terms of its macro effect on a society. But when one pries the lid of the Afghan war open, what is revealed makes the Iraq war look “normal”. Beneath it is a giant web of sketchy political bargains involving warlords and network of major heroin dealers with friends in high places doing business protected by NATO forces or their allies in the Afghan government. Afghanistan now produces 93 percent of the world’s opium, making it by far the largest source of income in what is considered one of the poorest countries in the world, and this “good war” is largely a political and physical battle between rival warlords who control the flow of this global resource. NATO’s role is essentially to favor one and help facilitate the defeat of the other. Opium has been produced in Afghanistan for ages without causing any major problems to the country, but the explosive growth of the opium economy that we know today, based mostly around the opium derivative heroin, is directly linked to the awful wars of the past thirty years. Since the Soviet Union’s brutal invasion and subsequent occupation in 1979, Afghanistan has been largely controlled by the heroin economy and subject to strange international forces behind it. 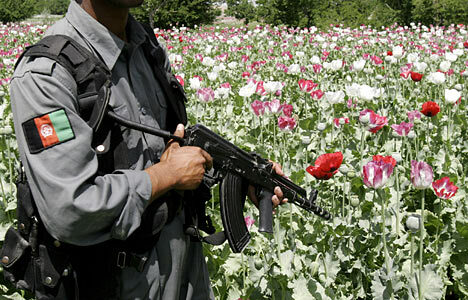 Under CIA supervision, members of the Afghan resistance, the Mujahideen, produced or forced farmers to produce poppy for heroin export on the global market throughout the 1980’s. The money paid for their fight against the Red Army and their unpopular Afghan puppet government, buying weapons and providing training for guerillas. Tens years of guerilla war was not cheap, so alongside U.S. dollars the guerillas created a vast “black economy” based in heroin-dealing, similar to the Contras use of Cocaine profits under CIA supervision to buy weapons and training for their fight against the Sandanista government in Nicaragua. Many Mujahideen commanders went on to become warlords in various factions; The Northern Alliance being one of the main bodies, the Taliban that arose in the 1990’s, and smaller but equally violent organizations like Gulbuddin Hekmatyar’s Hezb-e-Islami and the armies of commanders like Ahmad Shah Massoud and Rashid Dostum. These factions vied for power after the Soviet withdrawal in violent civil wars and continue that fight today, only now the Northern Alliance has NATO troops to back it up. Since the days of the Soviet occupation, the U.S. has maintained strong ties with key power-holders in Afghanistan to combat whoever their enemy is at the time. And the way to hold power in Afghanistan is to have your hands on the poppy-fields, or at least have your guns pointed at the farmers who have their hands on the poppy-fields and whom you tax in exchange for protection. Many of these power-holders are today’s political elites in Afghanistan, meaning they not only hold official power, but also enjoy cozy relationships with the United States and Britain, helping shape their policies around drug eradication and interdiction, among other things. The U.S. and Britain have overseen a poppy eradication program since 2002, when President Karzai first allowed the controversial practice. In the last few years, the eradications have been shifted onto Afghan forces with NATO troops and contractors as security. The Afghan institution that oversees this is the Ministry of Counter-Narcotics. The supposed theory is that if the Taliban is to be beaten, it will largely be through taking the heroin industry away from them. This is why the Afghan war has increasingly become a drug-war, with soldiers, Marines, and contractors sent to secure areas where opium is heavily produced. Taking these areas means the Taliban is unable to tax farmers, move product, and press farmers to cultivate opium. Targeted eradications that intentionally leave wealthy and well-connected people’s poppy fields in place makes one wonder if the goal of such operations is even drug-related, or if it just political. When you considers the balance of power in Afghanistan, or if say you are a U.S. official trying to figure out how to get out of the longest war in U.S. history as it grows worse and worse for everyone involved, you must work with the heroin lords. To leave Afghanistan, the U.S. will have to make agreements with heroin dealers so they can do their business in exchange for the “political stability” derived from their power. This is why many believe that a “war on drugs” in Afghanistan is a poorly acted out performance. Not only do heroin cartels manage to smuggle over 90 percent of the world’s opium out of a country occupied by multiple armies, they also manage to do it and still meet the world’s demand. Afghanistan produces 60 percent of the world’s heroin inside its roughly defined borders and exports the vast majority of it. An amazing feat on its own, smuggling the heroin out is the second half of the effort. The first half involves smuggling in hundreds of tons of the precursor ingredients needed to produce heroin, most notably the chemical acetic anhydride, which is produced in only a few countries under heavy supervision. So in a country occupied by multiple armies overseeing a drug war, they somehow cannot seize any more than 2 percent of the main precursors chemicals needed for the world’s heroin, which must be imported because it is not produced in the country. But a significant chunk of this price increase is coming from the increasing amount of bribes that one must pay to import heroin precursors into Afghanistan. This network involves many levels of government, illegal organizations, foreign governments, companies, and more. They are the people who hold power over the areas that one must pass through on the route to and from the poppy fields and the heroin labs. That’s the other side of the story, the one that involves officials in the Afghan and NATO governments. It also involves transportation worker and small time security guards, police, soldiers, and others armed people who control transportation routes into and out of Afghanistan. [v] Barnett R. Rubin. Road to Ruin: Afghanistan Booming Opium Industry. Center for American Progress, Center on International Cooperation. October 7th, 2004. [viii] UN Office on Drugs and Crime & Government of Afghanistan Ministry of Counter Narcotics. Afghanistan Opium Survery 2009, December 2009. [ix] UN Office on Drugs and Crime & Government of Afghanistan Ministry of Counter Narcotics. Afghanistan Opium Survery 2009, December 2009. [x] UN Office on Drugs and Crime. Addiction, Crime and Insurgency, The Transnational Threat of Afghan Opium. October 2009.